Now that we had picked the Dinosaur Birthday theme, it was time to create his Three-Rex invitation. To make it a little more fun and his own style, I had him help me out by picking out his favorite dinosaur illustration. He was so excited about the dinosaur he had picked out that once I was done designing his invitation, he called his papi over to show off his Dinosaur Birthday invitation. If you’ve seen any of my previous Birthday posts, you know Oriental Trading is my first stop when I’m planning one of our toddlers birthdays. When we celebrated Jade’s One In A Melon Watermelon First Birthday Bash, even though it’s not a common birthday theme, I found so many cute pieces and accents to really bring in the look I was going for. Of course I also had him help me pick out some of the decorations. 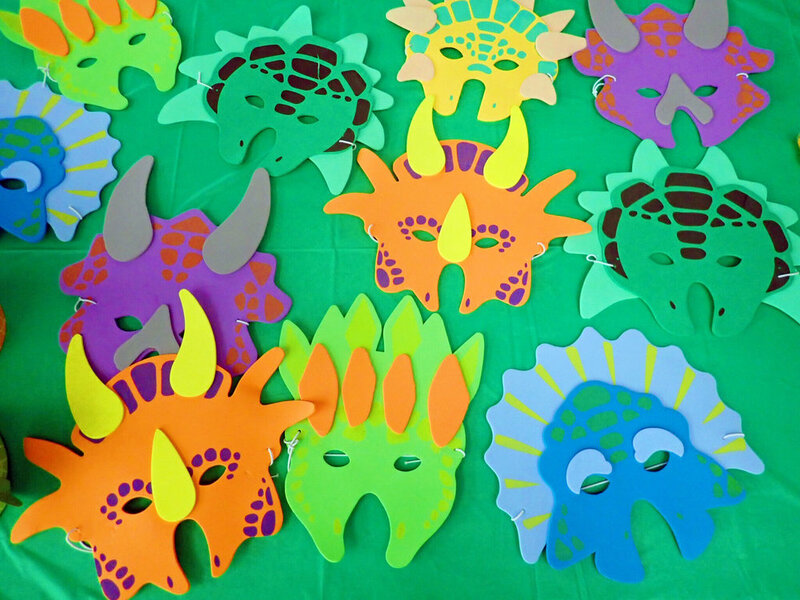 How perfect are these dinosaur masks and hats?! The Dino hats were perfect for the smaller kids who wanted to keep it cute while the dinosaur masks were great for the big kids who weren’t scared of really taking the birthday theme serious. You can’t go wrong with fun, colorful, dinosaur lollipops at your little one’s birthday party. A mix of frosted cute dinosaur lollipops and fiercer looking dinosaur lollipops to keep the theme, some laid out next to the dinosaur masks and other placed in mini green tin cans with (chocolate sticks). When it came to games we started the fun with Pin the Horn on the Dinosaur which the little ones loved and we’re actually surprisingly good at it! We did the party at our Gym so of course we had to make them work up a little sweat with an obstacle course game ending with a cone ring toss. Instead of Hot Potato, they played Hot Dinosaur (which I, obviously, made up but was perfect for Achilles’ Dinosaur Birthday party). It’s been 4 birthdays between my two babies and for all I have either gone with DIY Kraft bags or favor boxes that fit perfectly into the birthday theme. These dinosaur favor boxes were the perfect way to have the kids take their goodies home. Beside sweets, I filled their boxes with a surprise hatch egg and Dino Doo Dinosaur candy dispensers. 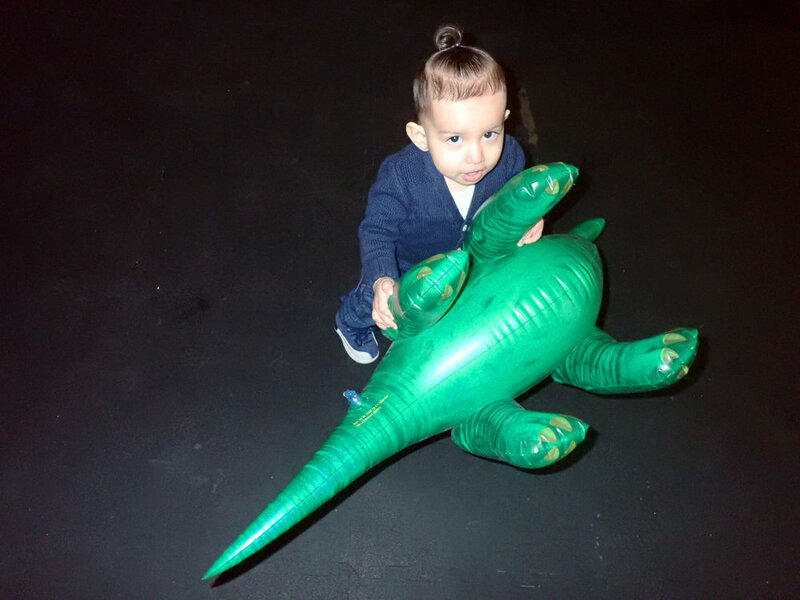 Just as I had expected, the inflatable dinosaurs were the hit of the party and the kids had a blast playing with them! Instead of Hot Potato, we even played Hot Dinosaur (which I obviously made up, but was perfect for Achilles’ Dinosaur Birthday party). Even better is that the dinosaurs survived the party and are home with us! This dinosaur birthday garland was the perfect piece to bring it all together. I actually like that it doesn’t say Happy Birthday because it can now go up in his room! DINOSAUR PLATES, CUPS & MORE! With so much going on, I completely forgot to get pictures of the dinosaur plates, cups & napkins set-up but here’s a blurry vision of what they looked like. The cake plates were also super cute, check out here. There you go! 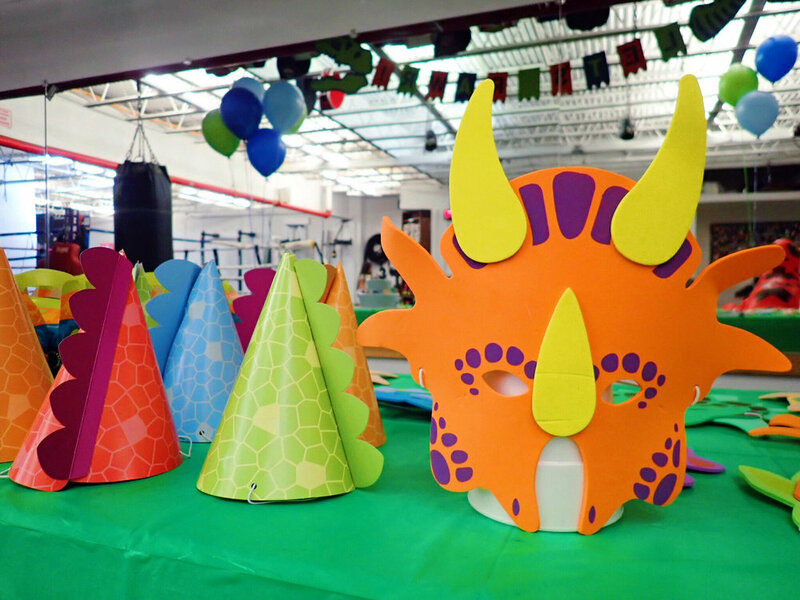 All the decoration, goodies and games that made Achilles’ ROARsome Dinosaur Birthday Party a total three-rex worthy experience. You may also enjoy: One In A Melon Watermelon First Birthday and Cars, Planes and Trains Birthday Party.